Gamers of all ages are always looking for the next exciting thing, and with EEG games, the way you play is going to change forever. EEG headsets have completely revolutionized gaming—and that’s because the only controller you need to play with the EEG headset is your mind! We’re here to give you the inside scoop on the most popular EEG games and entertainment apps available so you can experience the power (and fun!) of your brainwaves for yourself. 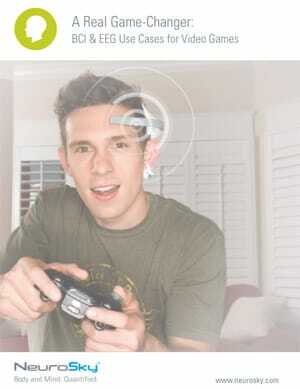 EEG games are the future of gaming, and to play, you’re going to need an EEG headset. Luckily for you, the world’s most affordable EEG headsets—the MindWave and MindWave Mobile—are both available in our online store. You’ll get into the game like never before with headsets that let you use your brain to control your games (like a telekinetic super-power!). Once you have your MindWave or MindWave Mobile EEG headset, it’s time to explore the amazing EEG games and apps you’ll have access to. While their are dozens of games and entertainment apps available for you to check out in the NeuroSky App Store, we’ve compiled a list of a few favorites right here, so you can check out which EEG games we’re playing! Invaders Reloaded – This 3D adventure lets you take on your greatest foes with nothing more than your mind… and a spaceship full of weapons and powerups! In Invaders Reloaded, the harder you concentrate, the faster and more powerful your weapons become. With 20 levels of space-age dog-fighting mayhem, this is a great game for fans of space age shoot-em-ups! Get Invaders Reloaded Now! Dagaz – On the flip side of Invaders Reloaded, we have a game like Dagaz, which helps you train your meditation levels through intuitive gaming experiences. The concept is simple—by using concentration techniques, the user can generate mandala shapes that grow and transform as your concentration levels expand. Not only can Dagaz be used for fun and relaxation, it has been linked with positive effects on sleep, mood, and more. Get Dagaz Now! FlappyMind – Let your brain control a brain in this fun side scroller. The object of this game is to raise and lower a flying brain, making sure it avoids every obstacle in its way! Get FlappMind Now! 28 Spoons Later – Most zombies don’t have the manners of the ones you’ll find in 28 Spoons Later—sure, they ‘ll want to eat your brains, but they’ll only do it with spoons! Of course, the simple solution is to bend any spoon you can find… with your mind! This game forces you to focus your attention on bending spoons before your zombie foes can get their hands on them and save your skin in the process. Get 28 Spoons Later Now! BlinkShot – Take target practice to a whole new level with BlinkShot! This eeg game requires you to concentrate and focus on a target, and then blink your eyes to unleash a plasma ball. The harder you concentrate, the better your aim and the more targets you’ll hit. Get BlinkShot Now! …and these are only a small sampling of the EEG games and apps we’ve got waiting for you! To check them all out, browse the NeuroSky App Store .